For the third week in a row, the church celebrates a historic festival of the faith. We began with the Day of Ascension, whence we remember Jesus’ farewell commission and accompanying promise to send to the disciples the Spirit of God, who would empower their mission into the world. 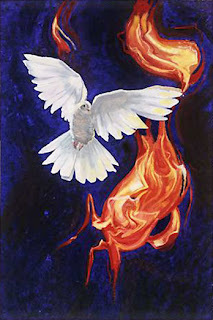 From there we moved on to Pentecost, wherein we celebrated the coming of that promised gift of the Spirit, who would be our companion along the way, empowering us and encouraging us as we fulfill our calling to be witnesses of the in breaking of God’s reign on earth as in heaven. Now, we observe Trinity Sunday, the one festival of the church that is focused on a doctrine rather than an event in the ongoing story of the revealing of God’s reign in this world, which God loved enough to send a Son, that those who entrust their lives to this reign might experience fullness of life. Growing up I learned my share of hymns and songs at church. Among these was the hymn "Onward Christian Soldiers." It's not in the Chalice Hymnal, but a generation earlier it was a singular favorite. GATHERING AT GOD'S TABLE: The Meaning of Mission in the Feast of Faith. By Katherine Jefferts Schori. Woodstock, VT: Skylight Paths Publishing, 2012. Xxvi + 218 pages. What is the meaning of mission for Christians living in the 21st Century? Is it something done “over there” on the mission field? Is it centered in converting non-Christians to the Christian faith? I once worked for the U.S. Center for World Mission (I was director of their library), and at the center of their vision was making sure the Christian message penetrated every people group. Or, is mission seeking to bring healing to bodies and souls? Is it defined in terms of acts of service – building schools and hospitals? Mission has many different connotations and nuances, depending on your theology and how you view your place in the world. Pentecost Sunday has finally arrived and some of us are wearing red or something that suggests the color of fire. We’ve come to celebrate the arrival of the Spirit of God, whom Jesus promised would come and empower the people of God. It’s also Memorial Day, so we stop to remember those who have died, whether they are family, friends, or those who have died in service to country. Perhaps the text for today offers us a sense of connection between the two. Jesus is about to leave his disciples behind, but he doesn’t leave them alone. If he goes away, the Spirit will come and be present with them, wherever they go in the world. On the Day of his Ascension, Jesus gave the disciples a commission – be my witnesses to the ends of the earth. He also told them to wait for the day when the Holy Spirit would come upon them, to empower them, so that they might fulfill this calling (Acts 1:1-11). The question is – did they do this patiently or not?